Many people have asked us why we have raised the spectre of antisemitism and why we re-iterate the fact that the campaign against antisemitism must be redoubled when our core remit is anti-Muslim hate. Well the answer can be articulately found in a recent phrase that the Chief Rabbi, Ephraim Mervis, used in a Telegraph article. Whilst we fundamentally believe in human rights and the rule of law, this means that the foreign policies and actions of any nation should be and must be scrutinised. Yet, what the Chief Rabbi is suggesting is that antisemitism (based on a backlash post the Gaza crisis), is an indicator of the levels of tolerance, or one could say, the lack of tolerance in society. The phrase, ‘canary in a coalmine‘ as used by the Chief Rabbi, therefore has a wider meaning for all communities. The Chief Rabbi is absolutely right when he states that Jews in the UK cannot and should not be held accountable for the actions of Netanyahu and his cabinet and holding a whole community to account is antisemitic. This is based on the simple premise that holding a whole community to a standard because of their identity is prejudicial and this also goes for those who believe that all British Muslims should be held to account for the actions of ISIS or those gangs of young men in Rotherham, Peterborough or Oxford who groomed young girls. It is simply ludicrous and prejudicial to do so, but this does not detract from self-reflection by some within communities. Yet, what the Chief Rabbi is getting at, is that antisemitism is a warning signal, an indicator that there are groups of people who are willing to target others, graffiti synagogues or make flippant prejudicial comments to Jewish community members going about their daily business. It is precisely this kind of activity that we have also picked up against Muslim communities, particularly post the murder of Lee Rigby and recently after the Rotherham grooming crisis broke in the press. Examples of such incidents can be found here, here and here. Time and time again, we come across prejudice, hate and bigotry targeted against Muslim communities and where all of the data shows that visible Muslim women going about their daily business, are at a higher risk of anti-Muslim abuse. Thankfully, whilst the abuse is not life threatening it does leave its impacts on those women who are targeted and examples of incidents and attacks are listed here, here and here. Which brings us onto the following depressing fact which needs to be raised. The CST have just released their July figures on antisemitic hate crimes and the figures make for grim reading, particularly when victim feedback on the profiles of their perpetrators indicate that a high proportion of the 107 cases where the profiles of the perpetrator are known, are of a Muslim background. (Victims reported perpetrator profiles in 107 out of the 302 cases in July 2014). We have said time and time again that all of us have a duty to scrutinise and hold powerful bodies to account and that holding the Israeli Government, or any other government to account for their actions, is within the rights of all of us as citizens. Indeed, it is our duty as citizens so that there is a check and balance to executive bodies, wherever they may be. However, daubing swastikas on a synagogue in Sussex, developing graphics with hashtags #Hitlerwasright and calling Jews terms that are associated with vermin are not acceptable, should be countered and are deeply offensive and prejudicial. They are simply not acceptable in our society. This should be nothing new and we have been at the front-line of what is challenging and complex work in tackling the cesspit in which anti-Muslim hate festers. We have seen Muslims called the following terms and prejudice extended, (after the murder of Lee Rigby), to attacks on 35 mosques in the space of 12 weeks. We have seen prejudice targeted at mothers, young women, school children, men, other Muslims and much of it maligns, belittles and caricatures British Muslims as ‘the other.’ This ‘othering’ in society means that the rights of individuals in that community are at very real risk of abuse. 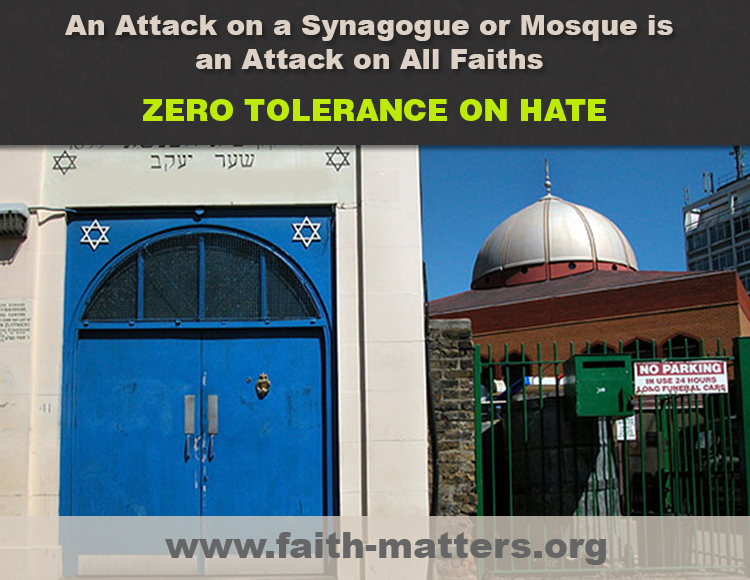 Antisemitism must be challenged just as much as tackling anti-Muslim hatred should. Targeting Jewish communities because of their identity, is just as bad as targeting the local mosque and builds a fear and sense of insecurity in Jewish communities that some Muslims also felt since the backlash post the murder of Lee Rigby. Yet, we cannot and must not forget one key factor. Jewish communities, so persecuted for thousands of years, quickly feel and sense societal ills around hate, intolerance and bigotry. If we are to tackle such bigotry and hatred and to ensure that we all live our lives free from prejudice and hate, it is imperative that we inform and educate our own communities in ensuring that they do not pick up and use rhetoric that is antisemitic in nature. Education, building a sense of empathy and developing an understanding of how language and rhetoric impact on other communities is paramount, as we expect others not to use language that is anti-Muslim in nature. It is as simple as that. The July Community Security Trust figures should therefore be a wake up call for serious reflection. We can all campaign, demonstrate and rail against policies that kill 2000 men, women and children in Gaza and against those who fire rockets and mortars into Israel, but that does not mean that we have the right to promote antisemitism or anti-Muslim hate against Jewish or Muslim communities in the UK. The CST figures mean a lot of community education work is needed in the future. Of that, there is no doubt.